Castle Comfort Stairlifts offers top brand stairlifts, keen prices and fast installs for all those seeking stairlifts in Kilmarnock, Ayrshire . And all work comes with our no-quibble guarantees and famous customer service satisfaction. It doesn’t matter where you live, if you aren’t as agile as you used to be it can be really frustrating. Even more so when you can’t get upstairs or down for that matter. That means some of your independence is taken away and as not all of us have the good fortune to live in a bungalow or the opportunity to move to one, getting up and down the stairs is important. 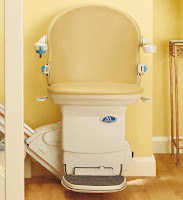 Castle Comfort Stair Lifts know from our own family’s experiences just how difficult this can be. Which is why 15 years ago we set up our family run company to make sure other families could receive the help and advice they need when this happens. We have local offices all around the country so that no one need find themselves in this predicament. The nearest office to Kilmarnock in Ayrshire is Glasgow some 22 miles away. Close enough to visit you in your home to see how we can help. Or just offer the advice at the end of a telephone. 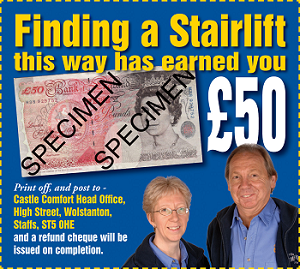 One thing’s for sure we should be able to set you up with the sort of stairlift that’s right for you and in record time. Installations usually take no longer than half a day. Just think you could be riding the stairway chariot before you know it. Let us assess your house to see whether a straight or curved stairlift is right for you. Or if you need a more specialist means of transport we have perch lifts for those of you who can’t bend your knees and wider ones which will take additional weight. No one need be left stranded. We supply all makes and you can get an idea of prices here. So people of Kilmarnock, once you’ve had a good look round our website, please give us a call if you need more information on 0141 278 3929 . Kilmarnock - Did you knows? · that Kilmarnock is famous for being the place that published the first collection of poems by Robbie Burns? · that Kilmarnock has the largest Burns monument? · that it is the home of Johnnie Walker Whisky? · that it is also home to the second oldest Scottish football club Kilmarnock FC? · that it was voted Scotland’s Friendliest Shopping town in 2006? · that Alexander Fleming who discovered penicillin attended Kilmarnock Academy? · that the Titanic’s carpets were woven in Kilmarnock? We know that Scotland is the home of whisky production, but did you know that Kilmarnock is the home to the brand Johnnie Walker? Well Johnnie Walker whisky has a long association with Kilmarnock. This whisky was originally known as Kilmarnock whisky and was first sold by John ‘Johnnie’ Walker in is grocery store. When Walker died in 1857 his son Alexander Walker inherited the shop and the whisky! It was Alexander and his son Alexander II who established it as a popular brand. Prior to 1860 blended whiskies weren’t legal so in 1865 Alexander, John’s son, produced their first blend, Walker’s Old Highland. In 1870 Alexander introduced the iconic square bottle for purely practical reasons – less bottles got broken and you could pack more into the same space! The angled label was further developed by John’s grandsons George and Alexander II, increasing the size of the text and introducing the colour names i.e. Red Label. By 1908 the company’s MD James Stevenson instigated a mini-rebranding renaming the whisky, Johnnie Walker Whisky and introducing the slogan ‘Born in 1820 – Still going strong!’ alongside the Striding Man logo. The Striding Man is said to have a likeness to the original John Walker in his traditional clothes. Johnnie Walker label colours are used to denote the different types of whisky and how and when they are used. The Blue Label for instance is ‘rare and expensive’ and intended for special occasions. The company is now owned by Diageo plc who also produces Smirnoff, Baileys, Guinness and Jose Cuervo Tequila. In 2011 they closed the blending and bottling plant in Kilmarnock despite protests and campaigns to stop them. Johnnie Walker production has moved to one of their other Scottish sites. Johnnie Walker remains the world’s best selling whisky. The story is told brilliantly in the short promotional film starring Scottish actor Robert Carlyle called The Man who Walked Around the World. This just shows how important Johnnie Walker was to the town of Kilmarnock. Losing their blending and bottling plant meant as much as the job losses. Though no one can take away the history. Something else that the locals are proud of is their local football club ‘Killie’ which plays in the Scottish Premier League. Another famous connection is the Killie Pie made by local bakers, Brownings and sold at their home games at Rugby Park. The Killie Pie is made from steak unlike the more traditional football game snack, Scotch Pie which is traditionally made from minced mutton. They look the same but taste very different. This pie has also made a name for Brownings! As we mentioned earlier Robbie had his first collection of poems published in Kilmarnock by John Wilson. This volume is referred to as the Kilmarnock Edition and can be seen at Dean Castle. In the 19th century money was collected and used to build a monument to Scotland’s national bard. The site of the monument which has been restored and cleaned after much of it was destroyed by fire in 2004. Here, there is a family and local history facility complete with a research room and archive storage. This facility allows work to take place on old, delicate documents in a climate controlled environment. Did you know you can spend the day researching your family history here? In the 1970’s the family gifted the castle to the people of Kilmarnock and it was opened to the public. Today you can see the Robert Burns Kilmarnock Edition of his poetry collection in the Banqueting Hall; a collection of arms and armour gifted with the castle in the Great Hall and musical instruments of the past in the Solar in the Keep. Dean Castle Park in the surrounding countryside has many trails and walks through the countryside and an education programme to help visitors protect what they see. For local residents of the town of Kilmarnock with its great histories and iconic links, Castle Comfort Stair Lifts just want to remind you that we are here to help. If you can’t get around like you used to, then give us a call to discuss the installation of one of our best aids, a stairlift. Just give us a call on 0141 278 3929.